Special Containment Procedures: SCP-3603 is kept in a standard containment cell in Site-██. At no time should the temperature in the containment cell exceed 4 degrees Celsius. Instances of SCP-3603-1 are to be kept in separate nature facilities depending on the color of powder covering their fur at time of emergence. All testing propositions with this object must be provided with approval from the current project head. 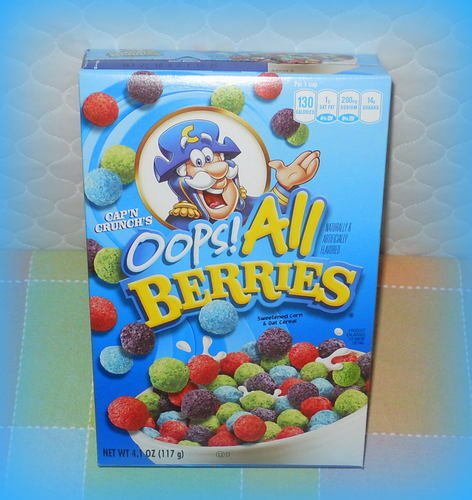 Description: SCP-3603 is cereal resembling Captain Crunch's "Oops! All Berries." On the box containing SCP-3603, every "Quaker Oats" is replaced with "Dundle's Food. "1 Testing has shown that both the box and plastic bag containing the cereal are not anomalous, although several people have stated "It just seems, off" or "I don't like the way the Captain is looking at me." Ingestion or insertion of instances of SCP-3603 into a living being, human or otherwise, results in no anomalous effects. However, personnel who have eaten SCP-3603 describe it as being stale, bland, and/or flavorless. SCP-3603 instances act as a seed. When put in a warm, moist environment, SCP-3603 will bloom at a rapid rate. Within 15 minutes, a bulb 2.1 meters tall resembling a watermelon will have grown no more than .5 meters away. When these are dug into or cut, a loud groan can be heard, followed by the tools used to harm the bulb breaking and shot out of the rind at high speeds. The same effect happens when more than one instances of SCP-3603 are placed 5 millimeters or less apart. When multiples of the same color are placed in this way, no extra effects occur. However, when two or more different colors are placed together, they merge and form a new seed the same dimensions as the originals. Where the excess mass goes is currently unknown. This instance of SCP-3603 is the mixed color of the originals. The growth period from here on is completely normal, though the resulting SCP-3603-1 instance is the color of the hybrid seed. After a period of time ranging from 15 minutes to 32 hours, the bulb grown from SCP-3603 will burst, followed by an emergence of SCP-3603-1. SCP-3603-1 instances artificially resemble Ursus Americanus (American Black Bears). However, instances of SCP-3603-1 are covered in a layer of powder corresponding with the color of SCP-3603 allowed to grow. Testing has shown that this powder is most similar to chalk and contains several non-biological pigments. It is not dangerous in any way and is generally removed due to normal conditions in the nature habitat, i.e. rain and wind. SCP-3603-1 instances have a number of anomalous properties depending on the color/colors allowed to propagate. For a full list, see Addendum SCP-3603-a. SCP-3603-1 instances are docile toward humans, and do not attack unless provoked. They live the normal lifespan of an Ursus americanus (with birth being substituted for emergence), and are not able to reproduce. They can be terminated through normal means, but show immense strength regardless of color. SCP-3603-1 instances are territorial and have a tendency to fight with those of different emergence colors, even if the powder is not still on other instances. It is unknown how they differentiate between themselves and instances of other colors. Resulting SCP-3603-1 Anomaly: Blue SCP-3603-1 instances periodically breath fire. No damage is done to SCP-3603-1 during these episodes. Notes: The fire is seemingly random and uncontrollable. 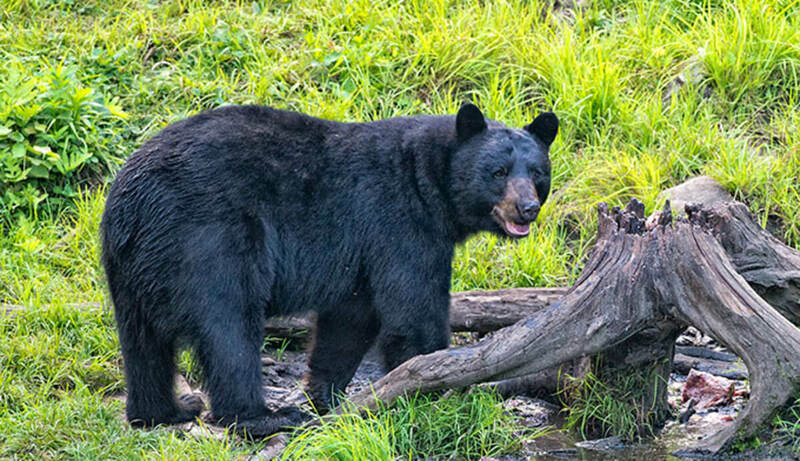 Resulting SCP-3603-1 Anomaly: Purple SCP-3603-1 instances appear as cubs for their remaining life, but show the same strength as a fully grown non-anomalous American Black Bear. Resulting SCP-3603-1 Anomaly: Red SCP-3603-1 instances can bite through any material less than four centimeters thick. They, however, cannot digest any material that they otherwise could not and die shortly after trying to eat the material. Resulting SCP-3603-1 Anomaly: Green SCP-3603-1 instances produce waste that acts as a "super fertilizer." When placed 12 meters or less away from any plant life, it will grow at an accelerated rate. Notes: This does not effect SCP-3603 instances. This seems to show that SCP-3603 is not a species of plant. Resulting SCP-3603-1 Anomaly: Brown SCP-3603-1 instances show a heightened sense of smell, and have been shown smelling food from up to 15 kilometers away. Notes: Please create no more. Do not create any more. Not after what it did to Johnson. No more. Resulting SCP-3603-1 Anomaly: Violet SCP-3603-1 instances appear orange on video or in pictures. No other effects have been observed at this point. Resulting SCP-3603-1 Anomaly: Gray SCP-3603-1 instances have a metabolism equivalent to standard lab mice. Notes: These instances have proven quite costly to feed, and as such, should be terminated. No more gray instances of SCP-3603-1 are to be grown. Resulting SCP-3603-1 Anomaly: Black instances of SCP-3603-1 do not exist in our reality. The only visible part of a black SCP-3603-1 anomaly is the emerging powder. After this powder is removed, its ties on reality are removed. Black SCP-3603-1 instances are presumed neutralized afterward, and no trace of them (physical or otherwise) have ever been recorded. 1. A Possible Group of Interest for the Foundation specializing in edible food-based anomalies. As of yet, all instances of Dundle's Food related items have been found consumable, albeit anomalous.